I’ve decided to be kind to Trump supporters. I realize that’s not something that everyone can do or wants to do. I don’t expect everyone to follow my lead. Everyone has a different role to play in this fight. Maybe I’ve got a reservoir of kindness because life has been pretty good to me. I’m a straight, white, male, so that’s already a lot. I might as well try and share what I have. Some people could say that I’m enabling hate and racism by not shunning Trump and his like, I disagree with that. As a Catholic, I’m a firm believer that we were made in the image and likeness of God. I want to presume goodness in people. And until they prove me otherwise, I’m going to do just that. I think it’s easier to change minds and hearts when you’re kind. As I said in my mission statement, I will use my kindness and empathy to fight injustice. I can fight the awful things in this world without destroying a person. here are some cynics who don’t believe in that. Well, good for them. That photo of the black cop helping a white supremacist protester who’s suffering from heat exhaustion personifies how I’m feeling. As we walked towards the meeting point on Saturday morning, there was a man with a sign and a bible. He was preaching and basically telling us that he had on good authority that we were all going to hell. As we walked by, I said to him, “Have a nice day.” It took him a few seconds, but when I was a few steps away from him, he replied, “Have a nice day too, sir.” I doubt I changed his mind, but a little kindness can’t hurt, can it? This essay by Courtney Martin sums it up well. It’s not so important that I truly see Trump (does he even see himself?) as much as the nearly 62 million people who voted for him. Presuming their malevolence is a risk I’m unwilling to take. It would mean that we really are made of different stuff, which seems not only intolerant, but dumb. We all start from that terrific vulnerability. We all have mothers, whether they stick around or not. We all want love, meaning, safety, and sandwiches. We all tolerate a tremendous amount of risk, which is to say we keep waking up every morning and trying to be people in the world, which is inherently risky. I’ll start there. The crowd on Saturday morning at the Minnesota State Capitol was the friendliest crowd I’ve ever been in. I couldn’t turn around in the green line car, and we passed hundreds of people waiting on train car platforms. On a Tuesday in Boston that would have been cause for yelling, shoving, and even more general unpleasantness. But on this day, people seemed to get it. People cheered from train platforms even when someone said that there wasn’t any room. People just seemed to be energized by seeing other like-minded people out there, showing up for the same cause. At first I didn’t think I was going to hold a sign. I had spoken with my mom the previous afternoon, the day of the inauguration. She wanted to come, but it didn’t work out logistically to come down. So I told her that I’d march for her. I thought I might as well make a sign that showed it. 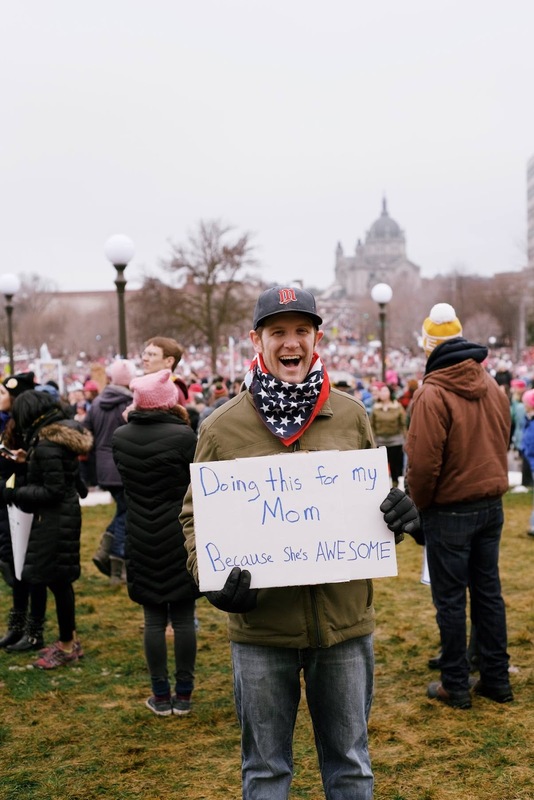 I wrote, “Doing this for my mom because she’s awesome.” It was a pretty popular sign. Not to brag or anything, but I was stopped by about a dozen people who asked to take my picture. I even made it into the Apple Valley High School student newspaper. I posted a few pictures of the march that evening. It was fun (and a good ego boost) to see the likes and compliments, as well as the photos from all the different marches. A few of my friends, who I presume voted for Trump, started a discussion on one of the photos. I usually don’t respond to comments, but I thought I could be kind and polite, and still answer their questions. I went back and forth a few times, but then I went to bed. My new year’s resolution was to stay off of social media on Sundays, so I didn’t check any of the threads that evening. I received a few text messages from friends saying that they didn’t mean to start a family fight. I wasn’t exactly sure what they meant, but later that evening, I opened my messenger app because I needed an address for a friend and I saw another message from my cousin mentioning something about a Facebook discussion. It was 10 p.m. and I thought it would be best if I didn’t check on it that evening. I opened up Facebook this morning to 38 notifications. Normally I’d be happy about that, but I clicked on a few. There were dozens of comments back and forth between friends and family members about Trump, the march, and everything in between, and it got nasty. I decided not to read through them. I really just didn’t want to be angry. So I decided to write something at the bottom more or less saying that I was disappointed something that I got positive vibes from devolved so quickly and that I’d happily message with anyone who wanted to continue the conversation via direct message. I was upset, but I decided to turn back to my mission statement: I will use kindness and empathy to heal wounds, build bridges, and fight injustice. There are some people who get off on internet comment wars, but I’m not one of them. There are some people who like confrontation, I’m not one of them. There are some people who want to fight (in more ways than one) Trump supporters. I’m not one of them. However, I’m not going to be a pushover. After church on Sunday morning, I was eating donuts and drinking coffee with my parents and a couple of their friends came over to join us. I had seen them before, but I had never met them. The march eventually came up and the woman said that she couldn’t believe so many people were marching for abortion. That was not the case for me, or for probably lots of people. I doubt anybody would say that they were marching for abortion if they were asked that question. My mom mentioned my sign and I said that I was marching to stand up to every awful thing Trump’s campaign represented. I said I was marching to support immigrants and refugees. That got the guy off. He went on to talk about how if we didn’t have a border, we wouldn’t have a country. And he said that America can’t take the whole world in. I took a deep breath. I told him the story about a lawyer I know who fled Honduras after his mother was murdered by a gang. I told him that he claimed asylum in the U.S. and that he eventually went on to get his degree, law degree, and pass the bar. His practice now focuses on providing representation to low-income Spanish-speaking people in civil cases, a greatly underserved market. I told the guy that I was glad I lived in a country that had the mechanisms to get him here. It felt good to go off like that. I wasn’t unkind or mean, I just wanted to make sure my point of view was heard. It was. I left soon after that. These next four years are going to be tough ones. I’m just glad this weekend gave me hope to get through it all.